"You can make a case that they missed the opener, but the game has already moved 2 points toward NMSU, so there's no arguing that they seem to be on the right side." A Recreational bettor just took a total position of $98,000 to win $90,000 on ASU -2 over St. John's. Books are starting to get quite heavy with public money on ASU. "Looks like we will need St. John’s to win outright"
St. John’s has the feel of a side where the sharps are just waiting to attack. 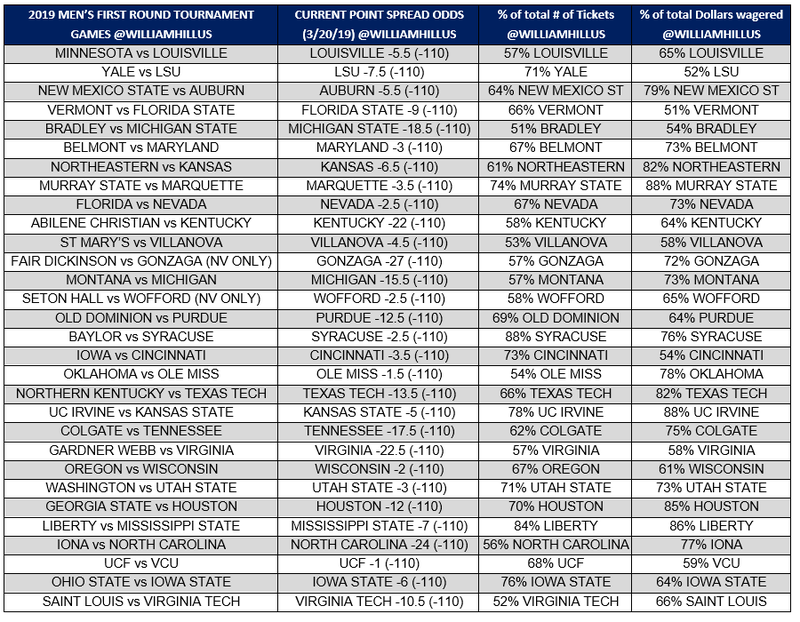 "We've taken a few sharp bets on some of the lesser-known mid majors so far. Murray State, Vermont, Montana, and Abilene Christian have all seen sharp action Thursday, and NMSU and Liberty on Friday." As expected, there it is ... Multiple “known” bettors have given up on St John’s +2.5 and have hit St John’s +2 across multiple books. "We have just taken multiple four-figure bets on ASU -2 vs. St. Johns"
The Cats are only receiving 53% of bets but a whopping 79% of dollars, indicating big sharp money in their favor. Using Sports Insights Bet Signals, there was a big steam move on UVM at +9.5. There hasn't been a single conflicting move (or buyback) on Florida State.